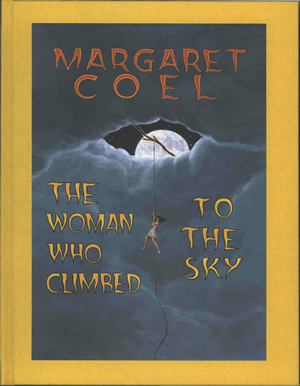 This is the full and detailed view of The Woman Who Climbed to the Sky by Margaret Coel, the modern retelling of an Arapaho story. The introduction was written by Tony Hillerman. This is a hardcover illustrated book with clear plastic slipcase, bound in yellow cloth-covered boards. The illustrations, including the front cover art, are by Phil Parks. The title, author's name, and "A.S.A.R" are printed in white on the book's spine. The end papers are textured black. The inside front and inside back covers are blank. Binding: Yellow cloth-covered paper boards. Has clear hard plastic slipcase. The title, author's name, and "A.S.A.R" are printed in white on the book's spine.